Mommy and I belong to several Facebook groups for tortie lovers, and last week we met a very talented artist named Breeanna Benton. Breeanna is owned by two tortie ladies, Voodoo and Jynx, who inspired her to paint a Halloween tortie ornament. When she offered personalized ornaments for sale we couldn't contact her fast enough. There was an audible gasp when Mommy opened the package...isn't it just the cutest??? The ornament won't be put away after Halloween is over, that's for sure! Breeanna told us she's planning a Christmas tortie too and our order is already placed! Interested in a personalized ornament of your own cat? Breeanna doesn't just paint torties, and she does a lot of custom work. Contact her via her Facebook page for more information. Her prices are super reasonable too! 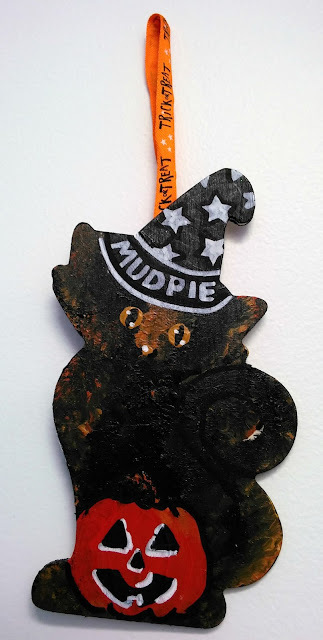 We're entering our Halloween tortie ornament in Athena's Caturday Art blog hop. 1. Hug a cat every day. 2. My favorite magazine is Catster. I enjoyed Cat Fancy but I adore Catster. It's the only magazine I have a print edition subscription for; everything else I get digitally now. 3. Recently, I stumbled upon the Cat's Meow toy that Mommy had bought for Truffles for Christmas one year and she never liked it. OMC it's SO much fun!!! I played with it for two solid hours on Thursday night and was devastated when Mommy picked it up fearing I'd turn it on in the middle of the night! 4. Even though I demand to be an only cat, I sometimes think it might be fun to have a playmate. OMC, that is SO adorable! Well... That is SURE Mudpie-ish! MOL! What great fill-ins! #1 is more or less my life motto. And, Mudpie, I understand your fondness for being an only kitty, but I bet you'd have a lot of fun with a kitty sibling! Purrs! That is a really cute ornament! And Mudpie, Paisley and Webster would both like you to know that, while it can be fun to have a playmate, sometimes they're a total pain in the tail! Mudpie, Annie agrees with your answer to #4 in spite of living now with Pierrot for over two years. The ornament is just perfect. We can see why you wouldn't want to put it away. OH I love the ornament!!!! I love the ornament, so cute. Thank you both for participating in the fill-ins, great answers. I love Catster too, much better than Cat Fancy. Have a great weekend! That is such an adorable ornament. I'll be looking at her FB page shortly! I hear you with answer number 4, MP. Love that ornament. Pop may need one for me or is that OF me. Oh, my! We hug several cats every day! We agree; it is important! 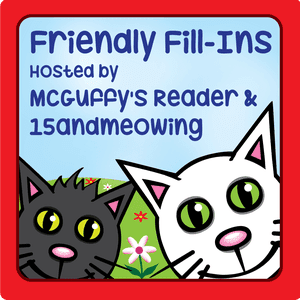 Thanks for joining us for Friendly Fill-Ins. I have been sick with a very bad cold. Stay well!